Former President and opposition stalwart, Mohamed Nasheed, on Tuesday asked for a military backed Indian diplomatic intervention and also US economic sanctions against the Maldives. India is yet to react to this. A military intervention is almost ruled out given the fact that these days India does not resort to military action but only indulges in saber-rattling, at the most. But what it will do is to send a Special Envoy post haste to urge talks and gently read out the riot act. This is expected to succeed. An important factor is Yameen’s weak position. The heavy flexing of muscles he has been indulging in is unlikely to bring him support as he has curbed the democratic rights of all Maldivians and not just his enemies or rivals. He has even curbed the Right to Silence when being interrogated. The judiciary and parliament have been completely crippled under the Emergency Regulations. The Supreme Court Chief Justice Abdulla Saeed has been arrested along with fellow judge Ali Hameed. The chief of Judicial Administration is being interrogated. All of them are being questioned on allegedly shady property transactions. On the political front, apart from arresting two former MPs, who the Supreme Court had re-instated last week, Yameen has arrested former President Mamoon Abdul Gayoom too. Gayoom’s son and MP, Maumoon Fariswas released on Tuesday by the Criminal Court, but the government could well refuse to release him as it refused to release the nine top opposition leaders who the Supreme Court had discharged last Thursday. Even China, Yameen’s only friend in the world, may not be able to save him because the Chinese Foreign Ministry spokesman, Geng Shuang, made it clear that China wants the spat between Yameen and the opposition to be settled by “dialogue and negotiations.” It also issued the most stringent travel advisory asking Chinese to avoid the Maldives till the crisis is resolved. China, being the greatest economic power in the region, is interested in a peaceful settlement of disputes here, and has, in the recent past, shown its willingness to mediate. While other countries only talked of the Rohingya crisis in Myamnar and did little about it, China brought about talks between Myanmar and Bangladesh, a move which won it friends in both countries. China has hinted that it wants talks in the Maldives and with the Indian military action looming on the horizon, it might take diplomatic initiatives to stem any such Indian move and settle the issue while warning other countries not to resort to force. India too is likely to move cautiously and not jump at the opportunity to intervene militarily just because opposition stalwart Mohamed Nasheed wants it. As in the case of the stand-off vis-à-vis China on Doklam and Pakistan, there was little else besides sabre rattling. Maldivian politicshas been one of the noisiest and volatile in the South Asianregion in recent times. The volatility and the instability that one is seeing presently, and has been seeing frequently in the last decade,could be attributed to a variety of factors, but fundamentally they appear to stem from the fact that democracy is new to the country, just ten years old. And power is still concentrated in the hands of an elite,which like all power elites, constantly scheme against each other to grab and monopolize power. The Supreme Court last Thursday ordered the government to immediately release from prison nine top opposition political leaders. Among them was former President Mohamed Nasheed. The court also re-instated 12 MPs who had been sacked earlier for crossing the floor. 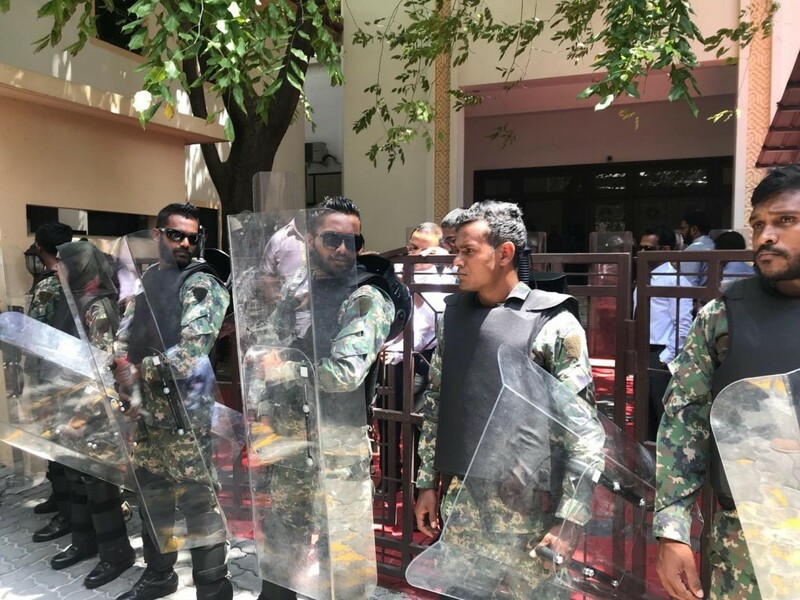 If implemented, these orders would have greatly strengthened the opposition parties both inside and outside parliament and helpedthe opposition carry out its threat to impeach President Yameen. On Sunday, Attorney General Mohamed Anil told the media that government has information about the Supreme Court’s plan to pass an order to arrest and impeach Yameen. Anil dubbed the move as unconstitutional and said that as per the constitution, only parliament can impeach and remove the President. He warned that the government and the police would not carry out illegal and unconstitutional orders. The Army chief, Maj. Gen. Ahmed Shiyam, who was by Anil’s side, said that the Security Forces would stand by the government in upholding the law and constitution. The Maldivian parliament minus a numberofopposition MP, was thought to be firmly under Yameen’s control. Vital resolutions of far reaching domestic and international import, such as the China-Maldives Free Trade Agreement (CMFTA), were passed in ten minutes flat without a debate. But then, suddenly on Thursday, the Supreme Court passed an order re-instating twelve MPs who had earlier been unseated for cross floor crossing. If they do come back to parliament and sit with the opposition, the latter’s power to pass an impeachment motion against the President with the required two thirds majority would have been enhanced. To add to Yameen’s woes, the Secretary General of parliament,Ahmed Mohamed,resigned, as he had been of the view that the reinstated MPs could start attending parliament. Fearing trouble, the Speaker decided to postpone the parliament session indefinitely and the Security Forces surrounded parliament. Two reinstated MPs, Abdulla Sinan and Ahmed Ilham, who had arrived from abroad, were arrested at the airport. Earlier, the Election Commissioner, Ahmed Sulaiman, resigned amidst former President Maumoon Abdul Gayoom’s allegation that Yameen is planning to rig the September 2018 Presidential election. After Sulaiman’s exit, the President decided to have an entirely new Elections Commission and called for applications. Meanwhile, the Supreme Court refused to accept the government’s plea that the nine political leaders ordered to be released by the court cannot be released because of certain legal and other concerns and that a mutually acceptable way has to be found to implement the release order. The government had pointed out that the leaders in question had been jailed for serious offenses like terrorism, bomb attacks, bribery, embezzlement and fraud. But the Supreme Court said on Sunday that it does not accept the government’s concerns as valid because the court is only asking for release prior to a retrial. The court’s point is that the trials which had ended in conviction were not fair. Meanwhile, in an effort to intimidate the Supreme Court, the government started investigating the allegedly questionable purchase of properties by Justice Ali Hameed and the Judicial Administrator Hassan Saeed Hussain.There were reports that Chief Justice Abdullah Saeed may also have been involved in such transactions. Justices Saeed and Hameed were later arrested. The Criminal Court also passed an order to arrest the Judicial Administrator,but the Supreme Court annulled it saying that the lower court had not followed the correct procedure. The government’s counter to all this was that the constitution bars the judiciary from interfering with the “regulatory powers” of the Executive and that the courts’ orders are “unconstitutional”. It also asked officer to defy the court’s orders. Later through Emergency Regulations, the government completely took over the judiciary by denying it all its constitutional rights. However, as on date, Yameen has the support of the army and the police.